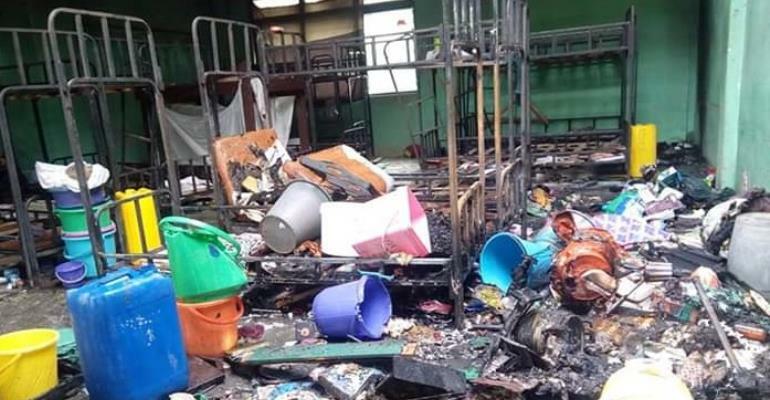 Information available reveals that about six students of Baidoo Bonsoe Senior High School in the Ahanta West Municipality of the Western Region collapsed when news reached them that fire had gutted their dormitory and destroyed their belongings. The six – all girls – were rushed to the Agona Nkwanta Government Hospital by the school's infirmary master and were responding to treatment according to a source at the hospital. Samuel Lord Quayson, popularly called 'Sir Lord', who described himself as the Coordinator of the School's Representative Council (SRC), confirmed the collapse of the six students to journalists. According to reports, the incident occurred early Monday morning when the students were in their classrooms. It took the swift intervention of personnel of the Ghana National Fire Service to douse the fire, preventing it from spreading to other rooms. The inferno destroyed items such as mattresses, rubber buckets, shoes and sandals as well as some bags belonging to the students. The Ahanta West Municipal Office of the Ghana National Fire Service (GNFS) at Agona Nkwanta managed to douse the fire just when it had reached the ceiling. The cause of the fire outbreak was not immediately known. Meanwhile, personnel from the service had begun investigations into the incident. Speaking to journalists, the Municipal Education Director who is acting as headmaster of the school, Mark Adoba Adatekey, revealed that a team of officers from the GNFS and the National Disaster Management Organization (NADMO) had been tasked to investigate the cause of the fire as well as ascertain the extent of damage. “All students who had their items destroyed are currently receiving counseling from the school's Guidance and Counseling Unit to stabilize them for academic work”, he added. He indicated that the school's cadet corps was also preparing some other rooms to accommodate the students whose dormitory had been affected. He pointed out that the report from the investigative team would determine whether the cost of the items destroyed should be borne by the school or which appropriate steps to take to prevent future occurrence of such incidents.